We wish our MarionPT members Chad and Sam all the best in competing in their individual events this February. Chad will be heading over to Geelong in Victoria to compete in his first ever Ironman 70.3 event on February the 18th 2018. 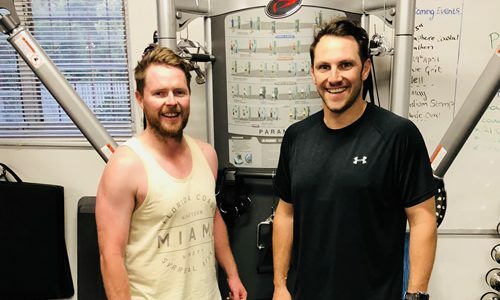 He has spend many months in the studio working on strength & conditioning training, following local triathlete Matty Whites Triathlon training program outside and competing in local tri events. Chad is looking in great shape and will be eager to push himself mentally and physically in the event. This proud dad and husband, has had his family’s full support throughout his training preparation and they will be cheering him on from the side lines at the event. Sam will be competing in the semaphore coastal half marathon on February the 25th 2018. 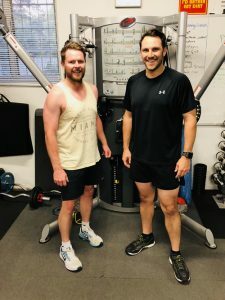 Months of vigorous high intensity strength training and following our half marathon program, has taken his passion to just jogging a few km to now focusing on the longer distance running events. This hard working tradie will be aiming on a solid time and achieving his goal. His lovely wife Lauren and family will be cheering him on from the side lines at the event.